As cities in Asia grow economically, they would also need to be smarter in their energy usage and management. What would smart cities with energy management of households, buildings and local communities look like? To find out more, Asia is Green looks at a smart city project in Japan. The Yokohama Smart City Project (YSCP) is one of the largest smart city demonstration projects in Japan, piloted in three Yokohama districts – the Minato Mirai 21 district, the Kohoku New Town district, and the Yokohama Green Valley district. This project was selected as a Next Generation Energy Infrastructure and Social System Demonstration Area by the Ministry of Economy, Trade and Industry in April 2010, and is expected to be completed by 2014. With a project area covering around 60 km² and a population of more than 420,000 people in 170,000 households, the project includes various aspects such as renewable energy, energy management of households, buildings and local communities, and electric vehicles. The main focus of the YSCP is to demonstrate energy management and demand response (DR) across the city with the goal of reducing carbon emissions by 25%. There are different Energy Management Systems (EMS) used in this project. Home Energy Management Systems (HEMS) are installed in 4,000 homes to achieve 20% total carbon emissions reduction through visualization of energy consumption and demand response. Building Energy Management Systems (BEMS) are installed for commercial buildings across the city, with an area of 800,000m², to implement optimized power control and reduce peak energy consumption by 20%. 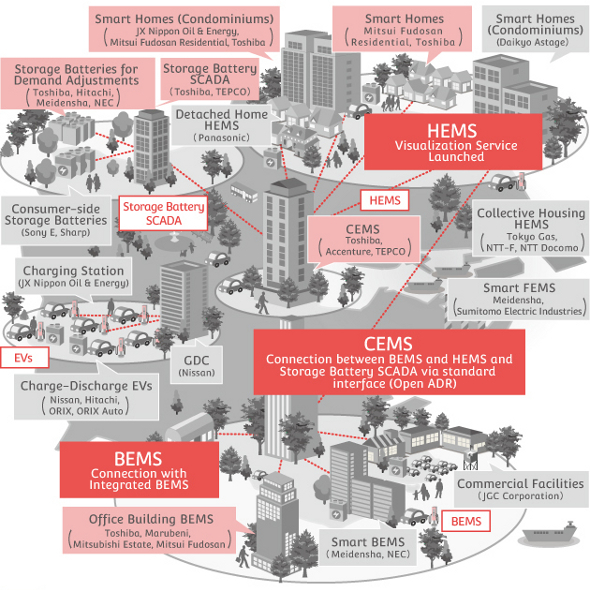 The Community Energy Management System (CEMS) provides system stabilization through the integration of the HEMS and BEMS with 2,000 electric vehicles (EVs), charging stations, SCADA storage batteries, and photovoltaic (PV) solar energy generation. The city is collaborating with various companies such as Toshiba, Accenture, Tokyo Gas, Nissan Motor, Panasonic, Meidensha, and TEPCO, to implement solutions for the smart city project. For example, Toshiba is responsible for the CEMS, BEMS, HEMS for condominiums and detached homes, and other areas. One of its solutions is to introduce an automatic demand response (ADR) system for condominiums, where Toshiba air conditioners installed in each unit connect to a CEMS that serves as a central control system providing control based on factors such as power usage to ensure optimum operation. Toshiba is also implementing its new SCiB batteries in 2,000 electric vehicles for this project. The rechargeable batteries feature superior safety and quick-charging performance with a longer life and high efficiency. The YSCP is a good case study on how a smart city can implement energy management and demand response at the home, building and community levels, together with solar energy, electric vehicles and SCADA storage batteries. After its completion in 2014, the results and lessons learned would definitely be useful for other cities in Asia.